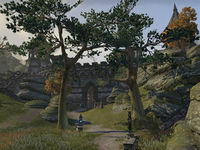 Newgate is a gate in northwestern Stormhaven marking the southern end of the pass to Rivenspire. The northern end of the pass is marked by Oldgate. The Spider Nest is located at the top of the western steps, along with a Skyshard. This page was last modified on 22 December 2015, at 17:33.